'Dark Souls: Year One Omnibus' review: Brutally magnificent – AiPT! The level of artistry and writing on these stories is epic. Dark Souls: Year One Omnibus from Titan Comics is out this month, just in time for the holiday season. Based on the groundbreaking and critically acclaimed video game series from Bandai Namco and developers From Software, Year One is a collection of stories about the treacherous and hopelessly oppressive world of Dark Souls. The first two stories in this collection were both written by George Mann and illustrated by Alan Quah. It starts out with “The Breath of Andolus,” a story about a hardened warrior named Fira and her companion, Aldrich the Scryer. Fira is plagued with the undead curse and, upon becoming a hollow, has lost all recollection of her past life. She and Aldrich set out on a quest from the land of Ishra to retrieve three artifacts crafted from the remains of the ancient dragon Andolus after his defeat at the hands of Barron Karamas. The scryer believes that when all three artifacts are recovered and placed into the dying Flame of Life, Andolus will be resurrected in the flame. It is then that Fira is to battle the beast and upon defeating it will bring life back to this dead world with the dragon’s last dying breath. The duo must brave the Crystalline Labyrinth, the Weeping Forest, and the Citadel of Barron Karamas to find all three artifacts, then make their way to the Pyre to complete the ritual. Once they reach the Fire of Life, the scryer places the artifacts in the dying flames, resurrecting the ancient dragon Andolus. What follows is a climactic battle of epic proportions between Fira and the beast. The hollowed heroine heaves her sword up into one of its fiery wings, crippling the dragon and forcing it to the ground. It is here that Fira must choose to either follow through with the hel quest and kill the Dragon, granting a temporary reprieve of new life from its dying breath, or spare Andolus so that the Fire of Life can once again be rekindled. The second story in this collection is “Winter’s Spite,” the story of Andred of Ithvale and his quest to hunt down and retrieve the Pyreblade, an ancient sword that belonged to his family and was stolen from him by a nameless warrior. Andred tracks the thief across the many regions of the realm, eventually leading him to a ruined dwelling in the Northern Wastes. The thief’s tracks suddenly stop at a strange magical orb, and when Andred touches it he is transported to a frozen wasteland realm. Andred quickly succumbs to the severe cold and conditions of this everwinter and is captured and put into chains. He is forced to fight like a gladiator for the amusement of a powerful pyromancer known as The Master. Andred escapes but is captured once again, this time by Etinger the Dead Duke of Ambervale. The warrior manages to escape a second time, making his way to the House of Winterspite for his final showdown with the nameless warrior. Lady Parnethia appears to him and proclaims him to be her guardian, and after a fierce battle with the Duke, Andred finds himself face to face with the adversary that has brought him to this desolate world. The nameless warrior confesses that he stole the Pyreblade in order to kill Parnethia and remove the frozen curse that she placed upon this realm once beautiful realm. The two warriors engage in an intense battle ending with the death of the nameless warrior. Andred saves Parnethia thus condemning the land to an eternity of disparity and winter. The third and final section of the omnibus is made up of two series combined into one story. “Legends of the Flame” and “Tales of Ember” consist of 12 short stories told as cautionary tales to a nameless traveller by an old witch and her cat Lathalia at the Firelink Shrine. It is here that the Traveller must decide between one of two paths to take, the path the left or the fog gate to the right. The traveler chooses the path of greed and takes the fog gate, but upon returning from the gate discovers that much has changed since he left. The old witch is long dead and the shrine’s flame is but a dying ember. Lathalia remains, however, and continues telling the tales to the hallowed one. As they near the final lesson, the traveler is grabbed by some vines and pulled down into the dying Firelink Shrine as a soul sacrifice. The nameless traveller resists his fate and punches up through the ground ensuring the resilience of humanity will live on this day. Another wonderful story is “The Labyrinth” by Dan Watters, which tells the tale of the city of Quan and how the exterior labyrinths help protect the town from the encroaching undead. In all of these stories, and their varied styles of writing, the common thread of disparity and themes of blood and steel, fire and darkness, and death and rebirth are all very distinctly Dark Souls. The artwork on this collection is top notch as well. Quah’s attention to detail and use of color and contrast is simply beautiful to behold. He takes this horrific world full of death, demons, and dragons and makes it vibrant and beautiful to look at. His work on both “Winter’s Spite” and “The Breath of Andolus” is magnificent. A couple other artists that stand out are Damien Worm and Danielle Serra. Both of these artists have a similar style of using two simple contrasting colors with complex detail in the stylization of the artwork. The combination of the two makes for some very interesting illustrations and they complement the rest of the collection in a very unique way. Overall this is a wonderful body of work by some very talented artists and writers. It really succeeds in capturing the disparity and the philosophical depth of the Dark Souls game franchise and uses creatures and themes from the games in a way that feels original and fresh. 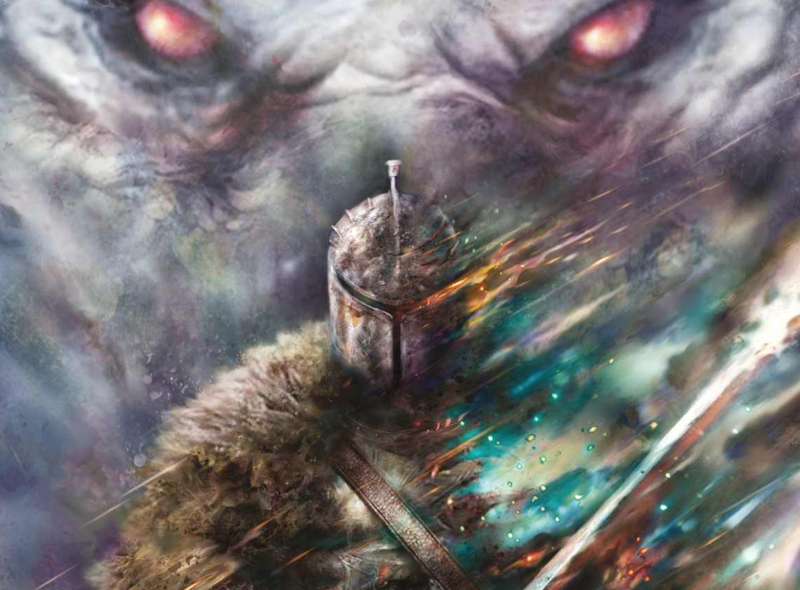 This Year One Omnibus is a must-have for any fans of the Dark Souls series. This is a magnificent body of work that complements and honors this groundbreaking franchising in the gaming world. It really captures the dark and savage feel of the games in a way that feels fresh and original. Aside from a few familiar creatures and monsters, there aren't a lot of characters or story tie-ins from the original lore of the games.